With 15 years of experience in the industry our professional fitters are second to none. Most single axle installations take little more than an hour and our fully-fitted prices include everything needed to complete the installation. From our location in mid-Wales we fit caravan movers across the length and breadth of the UK from the Midlands to Middlesex and Penzance to Peterborough give us a call for reliable, professional fitting, Nationwide. We can fit you new mover at your home or storage location, just call us to arrange the fitting. Truma, Purpleline and E-go products. you a full demonstration to get you started. 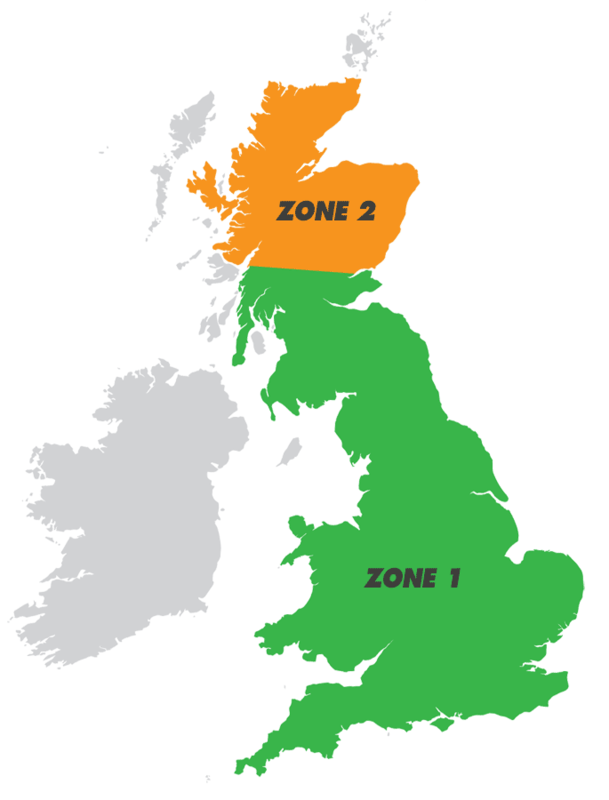 Note: All our fitted prices include fitting within ZONE 1 (see map to the right, click to enlarge). Fittings in ZONE 2 will incur an additional charge of £150. Fitting a mover to a single axle caravan takes about 1 to 1½ hours. Fitting all wheel drive models to twin axle vans takes about 2 to 3 hours. Please let us know in advance if there is an old mover to remove first as we will need to allow extra time. If you have any questions about any of the products we supply or about our fitting service please call us on 08000 226126. Hi Adam, Its not very often that I praise a company for their customer service, but I felt that I had to drop you a quick note to thank you and all your team for the 10 out of 10 service. From the first phone call I have been treated with the utmost respect, the guy that fitted the mover was professional, polite and efficient as are the staff on the phone. I wanted to write to let you know that I have been delighted with the service you have provided. The team you sent arrived on time, were extremely friendly and polite and carried out a first class job in a short space of time. It is so rare these days to get such a good service that it should be acknowledged. Hi Adam, I'm delighted with the motor mover fitted to my Bailey Senator yesterday. Andrew was very efficient, very personable and completely professional. He is a credit to your company and I will certainly recommend you to others. A big thanks to Andy for fitting the mover last night he was really helpful and stuck around to the very end. The customer service was very good. Can you add another £5 to my bill so he can buy a beer on me? Just a word of appreciation for the way your company dealt with me from my first phone call to enquire about which product would suit me best, to today when you fitted it The whole experience has left me believing that there are still companies who care about their customers and yours is right at the top. I have spoken to Adam, Graham, the lady on reception ( sorry don't know her name ) plus Andrew and Mark who I met today and each and everyone has been a pleasure to talk to. I could go on, but suffice to say, you've put a smile of satisfaction on my face. Adam, Just wanted to say thanks for the installation. The lads arrived bright and early and have done a lovely job. Thanks for excellent service and a competitive price. Hi Just wanted to express my thanks to both who came to Oban to sort out the problem with the fitting of the above to our Coachman caravan, it was much appreciated, good to meet the 2 guys, great service indeed. I would not hesitate to recommend your company. P.S., although not cheap, worth every penny. My new mover was fitted yesterday and I would like to say how pleased I am with your fitting service. Your fitters arrived on time, were very professional and completed their work very efficiently and quickly. After completion of the fitting, I was given a full hands-on demonstration of the mover and an opportunity to ask questions. I would be happy to fully recommend you and your staff to anyone who needs a new or replacement caravan mover. Good evening, Just a quick thanks for a job well done today by your guys and to let you know I have instructed payment to your account. Just a quick word to thank you all for a brilliant job done today . My powrtouch evolution fitted expertly. good communication with fitter who arrived bang on time and did a very neat and tidy job. The evolution works like a dream. Good advice before purchase on correct battery to fit my van was spot on. Very pleased with service and price, will go on my recommend list. Thanks Adam. Love the movers much better than my last ones great job guys.